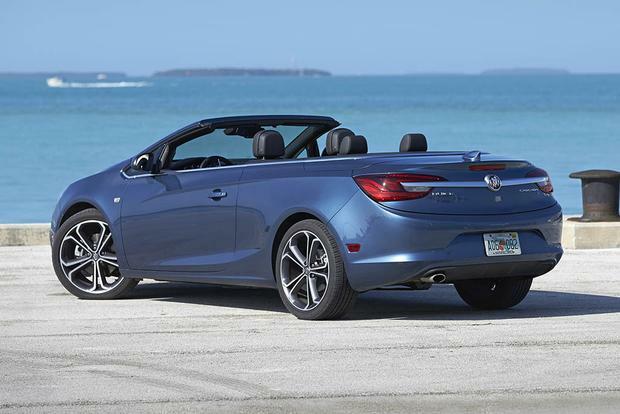 The 2019 Buick Cascada is a comfortable and reasonably spacious convertible with lots of standard features for the money. 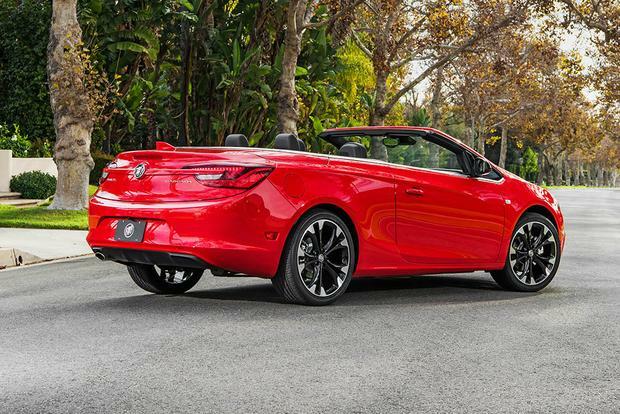 The 2018 Buick Cascada may be an imperfect convertible, but as one of the few available, it may be the only shoe that fits. 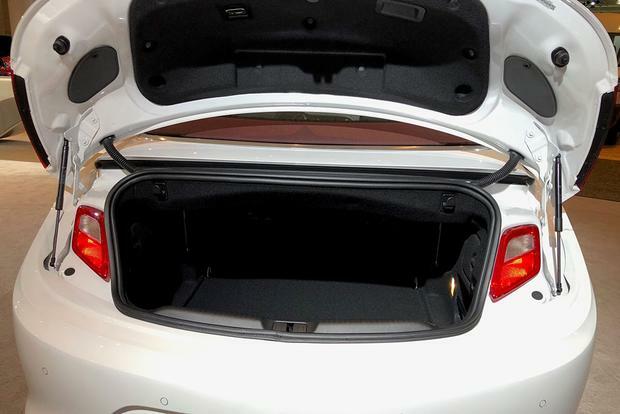 The Buick Cascada has taillights hidden under its taillights. Are you looking for an affordable 4-seat convertible? 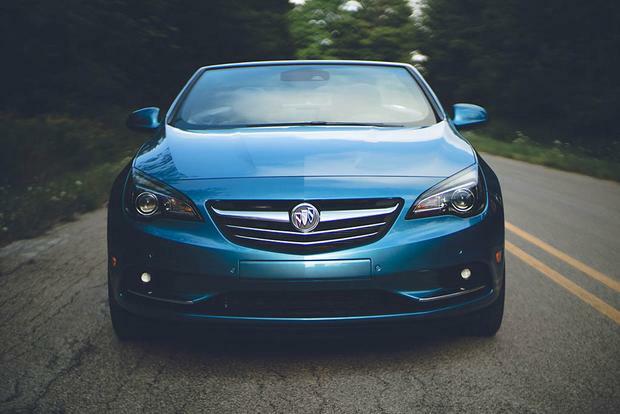 Check out our latest video, which takes a closer look at the 2016 Buick Cascada. Your choices are pretty slim when it comes to convertibles, especially ones that don't come with a sky-high price tag. Finding one with four seats can also be tricky enough, let alone one where those seats are actually usable by people rather than by packages or poodles. 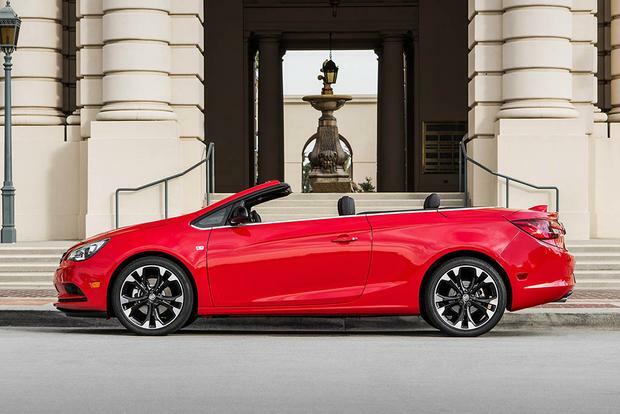 The 2017 Buick Cascada would be one of those scant few choices, a 4-seat soft-top convertible with commendable space and impressive value. Really, the Cascada's competitors are either smaller and/or more performance-oriented, significantly limiting their appeal. Admittedly, the Cascada's trunk and back seat wouldn't be what we'd typically consider spacious, but in the drop-top realm, they're actually quite good. At the same time, other similarly sized and equipped convertibles from luxury makers can costs tens of thousands more. So, for the right buyer, this Buick could be a Goldilocks just-right choice. However, there are some possible issues. For starters, the Cascada isn't really a Buick at all. It's imported from General Motors' European Opel division, where it's been sold as the Opel Cascada for years. This is a problem for two reasons. First, it might wear a Buick badge, but its Opel styling and quirky touches remain. Its antiquated, button-excessive center control stack in particular separates it from Buick models such as the LaCrosse. And second, it doesn't feel as new as its on-sale time in America would indicate. For instance, its jiggling and shaking over bumps is reminiscent of much older convertibles. 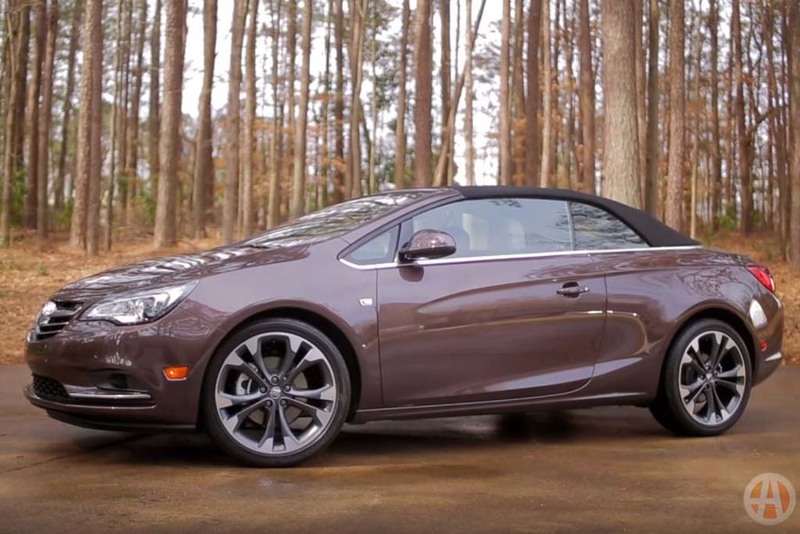 The Cascada is therefore a very imperfect car, but it may also be the only shoe that fits. 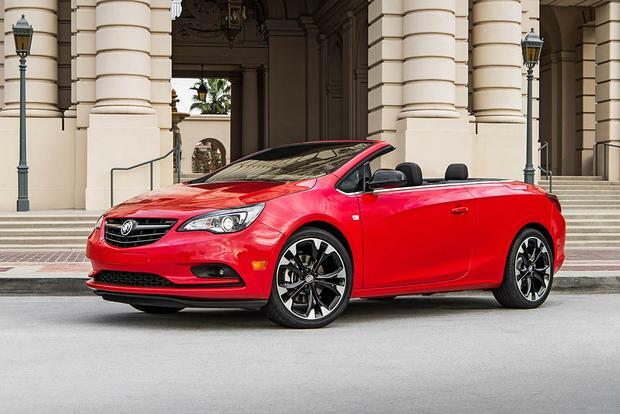 The Cascada offers one engine: a 1.6-liter turbocharged 4-cylinder that makes 200 horsepower and 207 lb-ft of torque. Available only with front-wheel drive and a 6-speed automatic transmission, it returns 20 miles per gallon in the city and 27 mpg on the highway. The 2017 Buick Cascada offers three trim levels: a base model, the more upscale Premium and the more stylish Sport Touring. The base-level Cascada ($34,000) touts a surprisingly long list of standard equipment that includes a power soft-top, 20-inch wheels, adaptive xenon headlights, rear parking sensors, a rearview camera, heated 8-way power front seats, a heated steering wheel, automatic climate control, the 7-in Buick IntelliLink touchscreen interface and satellite radio. Step up to the Premium ($37,000), and you get forward collision warning, lane-departure warning, front parking sensors, interior wind deflectors and a navigation system. The new Sport Touring trim ($38,000) only adds a flat-bottom steering wheel, special wheels and unique paint choices. The Cascada doesn't offer any options. The federal government's National Highway Traffic Safety Administration gave the Cascada a 5-star overall crash rating, plus 4 stars for frontal impacts and a 5-star side-impact rating. The Insurance Institute for Highway Safety has not crash-tested it. Standard on all models are rear parking sensors, front-side airbags, anti-lock brakes, a backup camera and traction control. Drivers who step up to the Premium trim will be rewarded with forward collision warning, lane-departure warning and front parking sensors. We only wish the Cascada offered a blind spot monitoring system and rear cross-traffic alert, as both can be important for convertibles given their notoriously large blind spots. 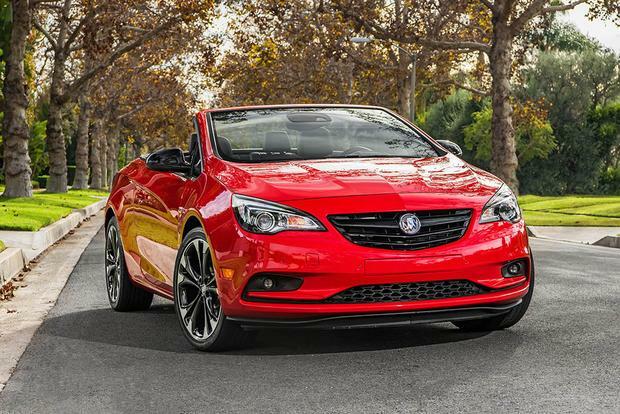 Despite the fact that the Cascada isn't a high-performance convertible, we were impressed with its sporty handling characteristics -- something we weren't expecting from a car focused more on relaxed, top-down style. Admittedly, the 200-hp engine dulls performance a little, as the Cascada is surprisingly heavy. It also tends to jiggle excessively over bumps (known as cowl shake), which is something that has been greatly reduced or eliminated altogether in other convertibles. On the road, the Cascada is quiet and smooth, with a relaxed, supple ride. With the top up, there's surprisingly little wind noise for a convertible. Top up or down, the interior is a little cramped for larger drivers, though the back seats are surprisingly large (while still not exactly roomy) for a car this size. To us, the Cascada's biggest disappointment is its technology, which is no surprise considering that this car actually went on sale more than 3 years ago in foreign markets. It certainly feels old, with the center control stack cluttered by a multitude of buttons and a traditional key -- rather than now-common push-button starting -- to start the engine. Buick's otherwise user-friendly IntelliLink system is also saddled with a smaller touchscreen than you'll find in other Buicks, and its placement deep within a cowl can make it difficult to reach. 2017 Audi A3 Convertible -- Audi's soft-top A3 Cabriolet convertible is more expensive than the Cascada, and it offers less standard equipment, but it boasts a stiffer structure, a higher-end cabin and better driving dynamics. 2017 MINI Cooper Convertible -- The MINI is smaller and has a lower base price than the Cascada, but it's also more modern on the inside and zippier to drive. 2017 Ford Mustang Convertible -- Admittedly, the Mustang is a fundamentally different type of car than the Cascada. However, given the Buick's price and available feature content, there are only so many convertibles to compare it with. Used Audi A5 Convertible -- The A5 convertible offers more interior room than the Cascada, along with better available performance and optional all-wheel drive. Prices are steep, though, so you may want to consider a used model.